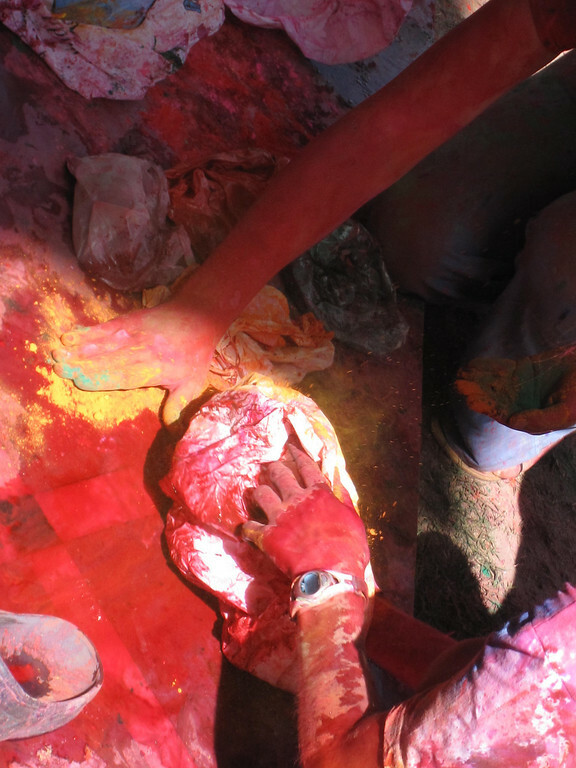 India’s Festival of Colors, was tops at my list of travel experiences when I planned my round the world trip. I love festivals, it’s such a beautiful, vibrant way to experience a culture. The rainbow of colors streaking radiantly happy faces during Holi stuck a chord with me. 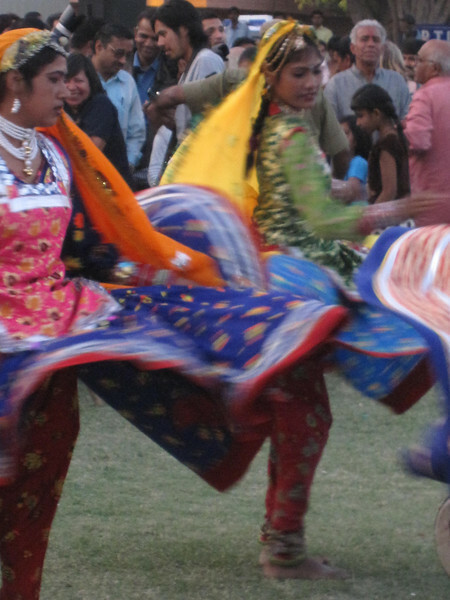 The subcontinent is a huge place though, and there are a lot of places in India to celebrate—each place has their unique take on the festivities. At the end of this post is a guide to celebrating Holi. For me, a little research showed that Jaipur hosts an elephant-filled extravaganza during the annual Jaipur Elephant Festival, which takes place the day before Holi. Sign me up! I planned my whole route and timing around the world so I could make it to see the colorful elephants and the joyous celebration of Spring. Rajasthan acts as the epicenter of the intense and frenzied Holi action, although the Festival of Colors is celebrated throughout the north India and even into Southern Nepal. There are celebrations in the south as well, but these are more subdued and focused on the religious aspects. The north is where those colorful faces and clouds of powder take place. 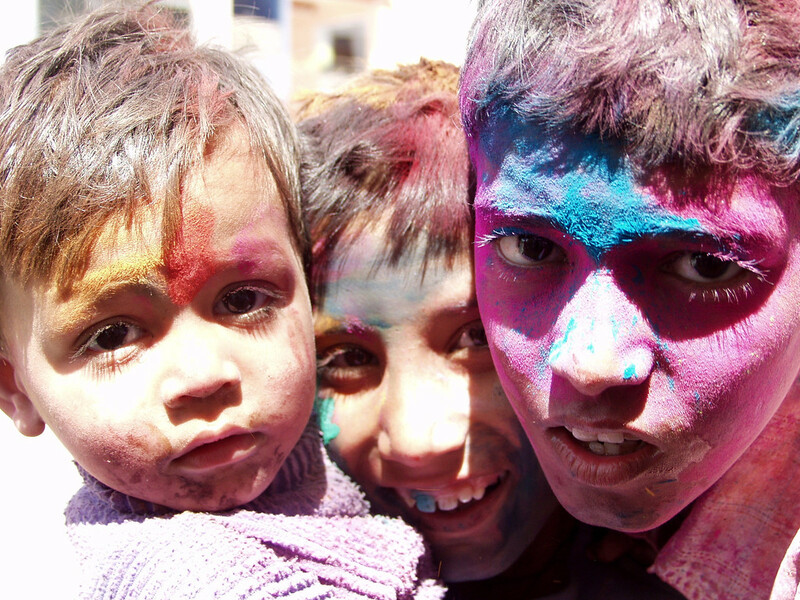 In celebrating Holi in full, various aspects of the celebrations occur over several days. Holika Dahan involves households all over the country purging darkness and negativity from their homes, they take these items into the streets and burn them in bonfires on the last night of Holi, which is the night before the Festival of Colors. 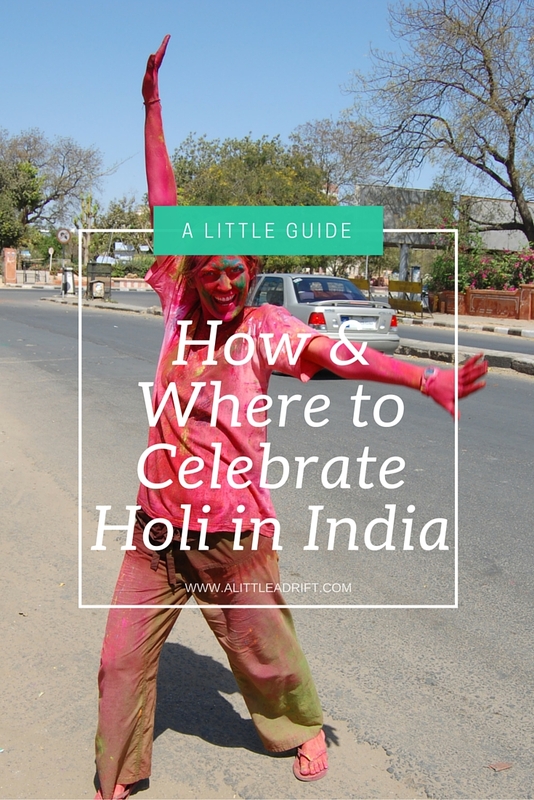 If you’re planning a trip to India for Holi, or wondering what it’s like to partake in the festival, this Ultimate Guide to Celebrating Holi in India will sort you with everything you need to know for a safe Festival of Colors. These three had clearly been enjoying the revelry for a while when I spotted them on a passing motorbike! 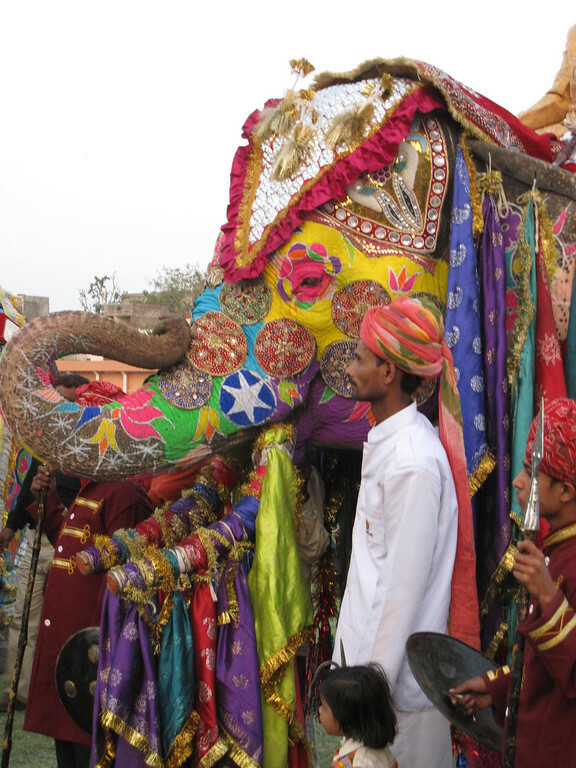 Jaipur is unique for holding the longest running elephant parade in the country. 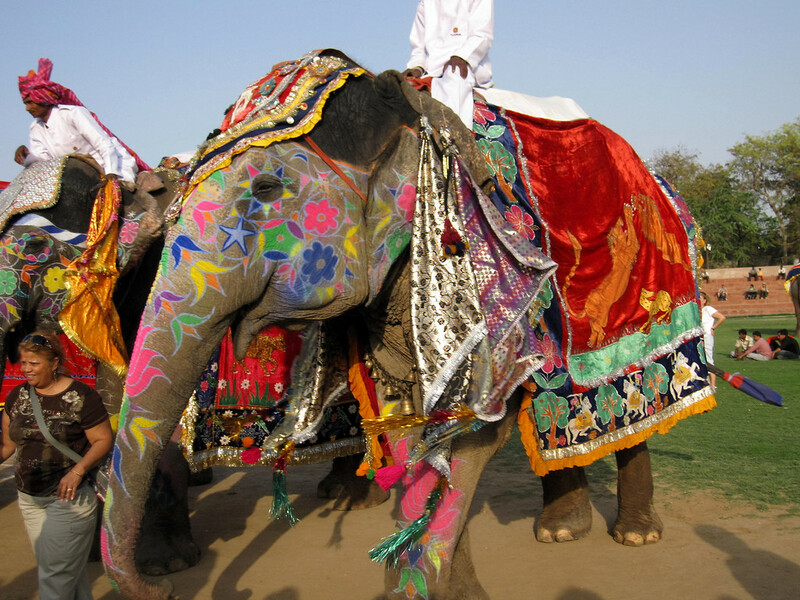 This parade has run for hundreds of years, and the Elephant Festival is certainly the most colorful elephant event! Energy shoots like electrical current through the Elephant Festival, and crowds from all over the region pour into Jaipur’s Chaugan Stadium the evening before Holi. The entire festival is keeping with what a I have come to love and hate about India—chaos and a touch of mayhem ruled the event. All of that confusion made some parts of the festival a little lackluster in some regards. It was nice, but my guidebook oversold the event a tad by rating it a must see. 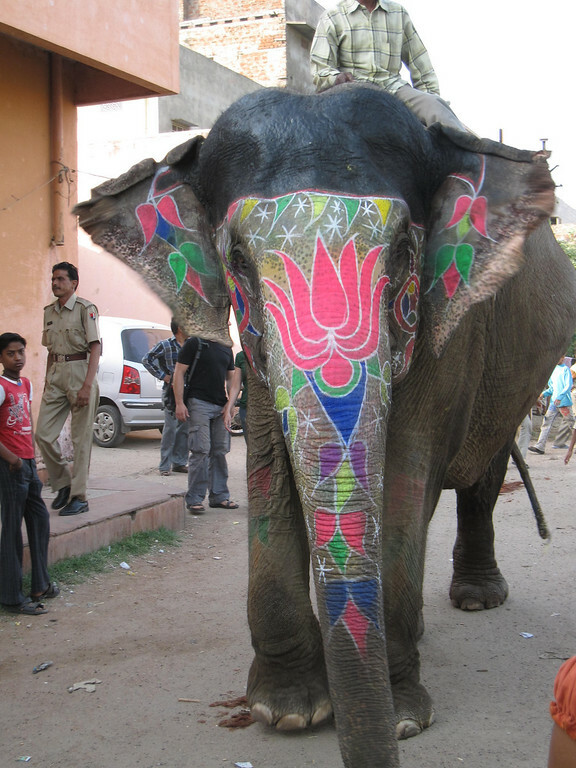 I am so glad I celebrated Holi, and the Elephant festival is both fun and beautiful. It’s a great option if you are already in Jaipur, but there are other wonderful places to celebrate Holi as well. The Elephant Festival really was chaos, and sadly that detracted from it. Some of the events on the schedule were delayed or moved to other areas without notice. The general day goes like this: parade of elephants at the Festival, followed by dancers, musicians, and the tourist verses elephant trainer tug-of-war. 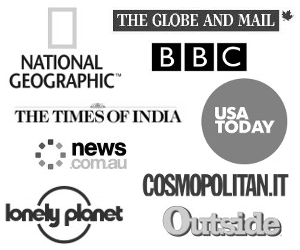 And though all of this happened, it was an event completely in line with the India-ness of it all: there was no order. The announcer couldn’t get people off of the field for long enough to perform the planned dances. Once the field was cleared, there was still no way you could see what was happening because the crowds refused to stay seated. I took quite a few gentle elbows to my gut with people vying to see it all! And the funny thing about the manhandling, it’s totally okay in India. There is nothing wrong with pushing someone out of the way, or standing directly in front of someone seated. This is just India, if you want the better view, you have to fight for it. 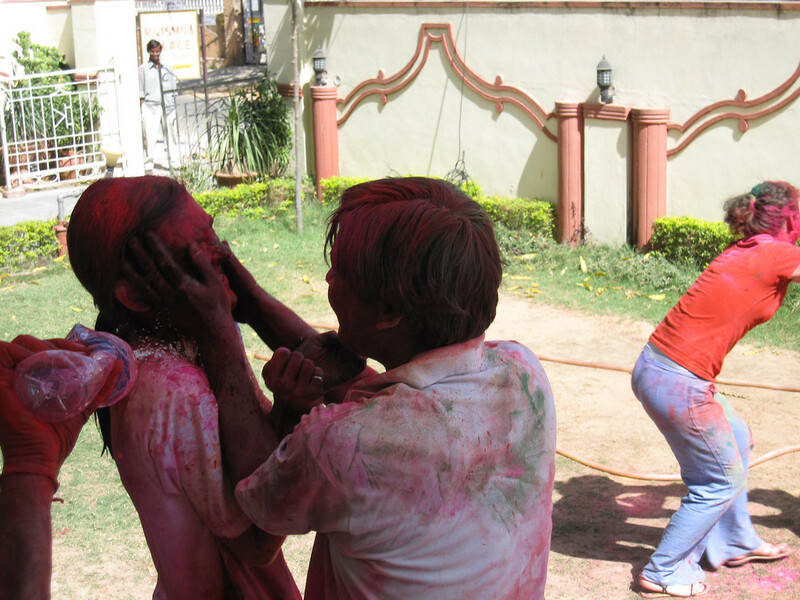 And mind you, this is still the day before Holi, so the festivities were only ramping up! And unlike in most of the Western world, there is no malevolence when they are doing. They fully anticipate that if you care enough, you’ll push back and also jostle for the better view. The festival was another reminder that in India, ,you can’t rationalize it. You have to go with the flow and surrender to the India-ness of it all. Speaking of surrendering to the experience, the height of my Elephant Festival activities peaked when I attempted to shove myself through a small four foot gap leading into Chaugan Stadium. Our tuk-tuk driver took the craziest route imaginable, across wildly unpaved streets jostled and bounced me around the backseat. This route was a “quicker” way into the Stadium. That’s the only explanation I was given from the tuk-tuk driver. I think he meant the most “interesting” way into the Stadium. It’s important to note that the festival is free, which we knew was the case. This was the main reason I was shocked that he wanted me to crawl through a hole in the chain-linked fence at the back of the stadium. All I could think was, “Why are we sneaking in?” Our rickshaw driver refused to drive us to the entrance, so my cousin and I wedged our much-larger-than-his western bodies through the hole into the “backstage” area where the performers and elephants get ready for the parades and shows. As we climbed through the fence, one hilarious yahoo informed us that the event was over and we should go home. For about 30 seconds, we believed him. Thankfully, we heard cheers, music, and crowds, and realized he was joking. Entering via the backstage area gave us a gradual view of the stunningly decorated elephants—even without the formal decorations, even the off-duty elephants had delicately drawn mosaics of colors adorning trunks and ears. The decorations only got more elaborate as we entered the field and the dancers and elephants were decked out in ornate and heavy costumes that must have seemed like lead weights to the performers. The event ended with a bit of police crowd control and chaotic scattering so I slipped back out of my secret fence and caught a rickshaw home to rest up for Holi festivities! 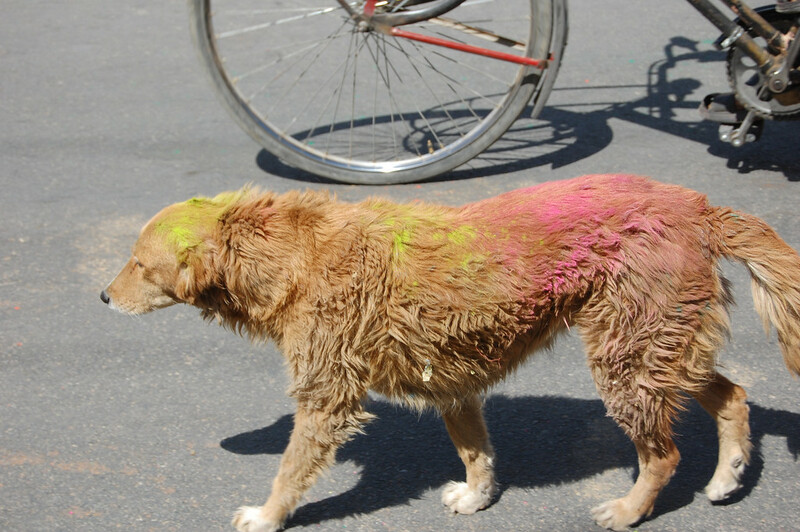 As for Holi itself, we were amply warned by heaps of people that there is absolutely no way that we should venture outside of our hotel during the morning hours of Holi. My cousin and I were traveling as two solo women, and the guesthouse owner just refused to entertain the concept. Instead, our hotel hosted a “safe Holi” for the other travelers at the hotel. Some of the dangers outside of our walls were: drunken men groping tourists, chemical paint spray guns (instead of the safe dyes they provided), and mobs of people who wouldn’t be able to contain their excitement if they saw a Westerner. 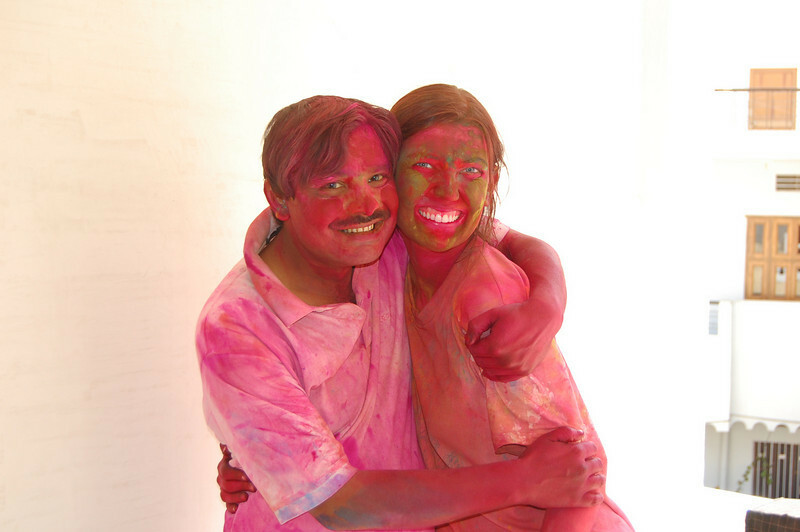 We were protected by the walls of our hotel for the main hours of Holi, and we had a blast. The owner at the Krishna Palace Hotel started the event off by smearing my face with the most vibrant shade of pink powder imaginable. Naturally, I was willing to dive right in and give back as good as I got. No amount of photos and stories can prepare you for the chaotic fun of smearing others with sweet-scented colors—ones that may or may not wash out of their skin. Some of the other tourists were shier. They had to be coaxed onto the patio so that we could play Holi on them. Jodi was my fearless friend and impromptu bodyguard during my post-Holi wanders when we walked around Jaipur to see the vibes after the morning rush of colors had faded a bit. It was all very tame though. The nature of the event is not to tackle the other person and coat them with color, but rather we were always politely asked before color was smeared onto our forehead, faces, arms, necks and into our hair. My cousin protected her naturally gorgeous red hair with a scarf since we were warned the dye is fairly permanent on light colored hair—me though? as a brunette now, I was like: BRING IT ON! The real fun came when the water-guns and buckets of water were brought out. Once water is added, the color mattes into your skin. The water unified the giant brilliant colored blobs of pink, purple, green, blue, orange, and red powdered dyes. The hotel owner and his son took particular pleasure in dousing me in a huge bucket full of water no fewer than six times. Then, the five-year-old neighbor boy ventured into our courtyard and similarly went on the attack with a huge water-gun. The whole event was a community celebration, even for those of us stationed in one house. Roving bands of musicians trotted into our courtyard, played rousing tunes, and then headed onward to the next house. 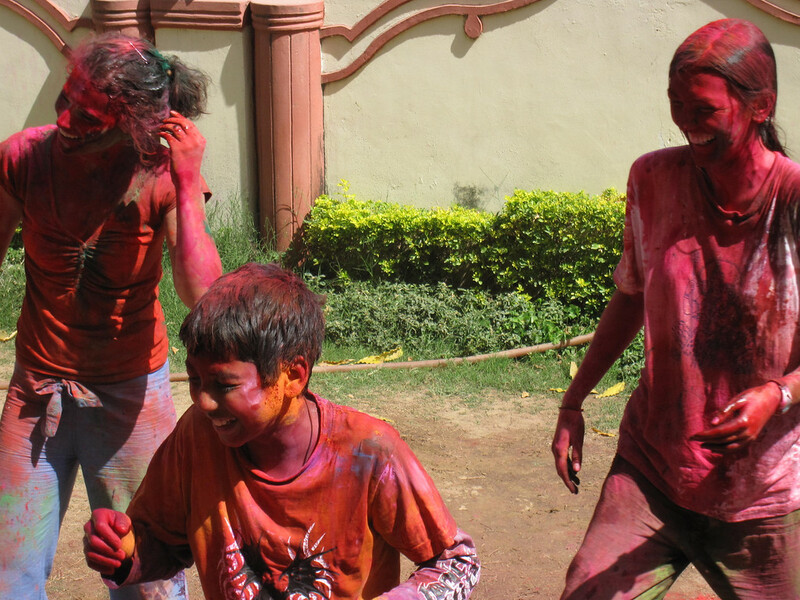 The hotel-owner’s friends came by with baggies of powered color so they could administer Holi smears and hugs to their friends and family. They also were happy to smear all of us now vibrant, multi-colored Westerners. There was a point at which my cousin was sure that the paint was so thick on my face that no more would adhere to my skin. That fear was alleviated. Within a few minutes, a fellow tourist dumped a bucket of water was dumped on me from behind. Perfect, then my face was primed and ready for more pats and smears of powdered dye. After a few hours, the hotel owner deemed the streets safe-enough for us tourists to venture out. I attached myself to two blokes from England. They acted as my protection should any of the Holi revelers get a little gropey. 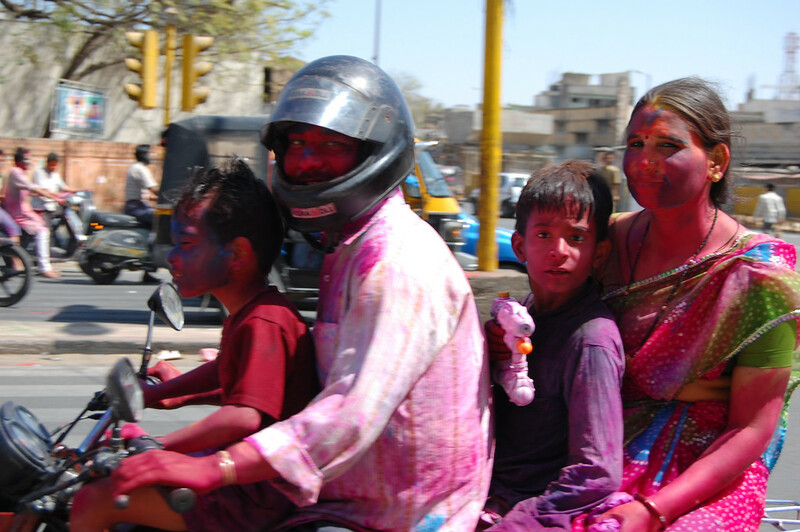 A colorful family during Holi in India clearly had a lot of fun! The family who lived in the guesthouse were fair game to dose in huge quantities of color! 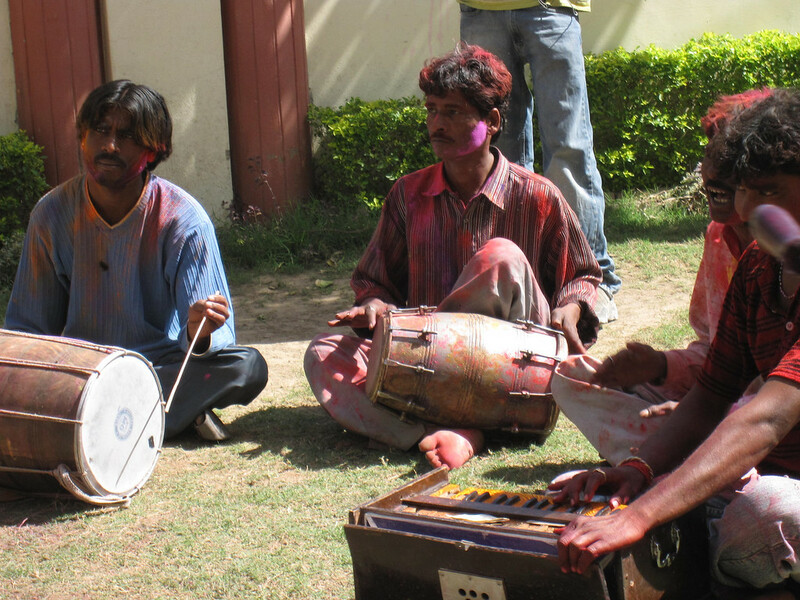 A local band played in the courtyard to make the festival of colors even more fun. To be truthful, 90 percent of the Holi revelers met us with complete joy, and merely giving hugs and smearing untold coats of paint on my face. But there were definitely some drunk on bhang. These few meant I was perpetually on the offensive. Eventually, I decided to no longer give hugs to the men. There were just a few too many unpleasant groping encounters. Even though some Holi revelers were not in the proper spirit of the festival, I had an absolute blast. Why don’t we have a holiday like this?! I have these hilarious imaginings of kids in the US going completely nuts and busting out the Super Soaker 10,000s (not sure the latest models of these as I haven’t seen one in maybe a decade?) to dose entire neighborhoods in color! 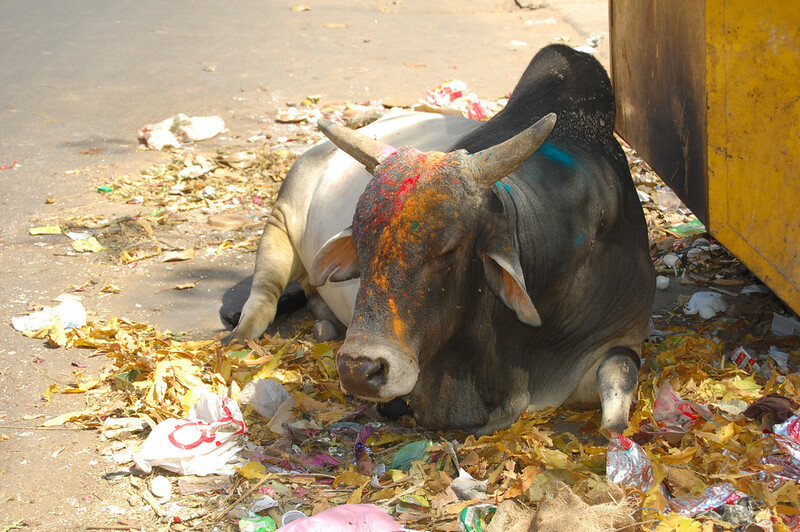 Even the cows get a splash of Holi color! And the dogs too, naturally! After an hour or so of wandering the town—when I’d had enough of the revelers on motorbikes screeching to a halt by the road to dose me in more color—I headed back to hotel for the lengthiest shower of my life. And, wouldn’t you know, that even after scrubbing myself with five different types of soap, I was gloriously, horrendously pink. My face took on an alarming shade of fuchsia. 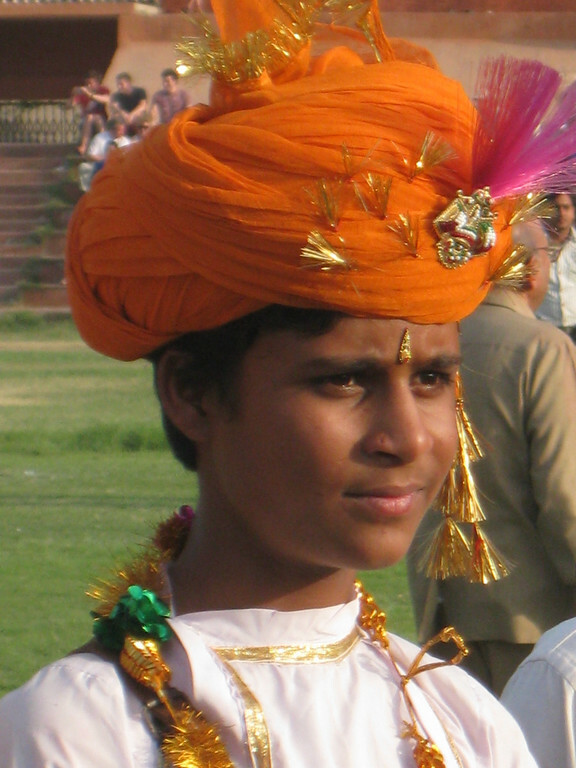 As luck would have it, then next day my cousin and headed to the Taj Mahal. It’s a bit of a riot that years from now, as I look at pictures of me in front of this magnificent UNESCO World Heritage Site, I will have the most peculiar pink hue to my skin! My cousin didn’t quite see the humor in this situation. But, she will come around once she realizes that, well, there is pretty much nothing we can do at this point except: pose, smile big, and laugh at the memories. After all of that revelry, it was time for one last scrub and a good sleep. We had a 6am train to Agra the next day! This was such a great time to be in India. I am truly grateful that I had the opportunity to celebrate this major festival. And what’s more, all knowledge is worth having. I have just that bit more cultural insight thanks to Holi. Boy do the Indians know how to have a party! The most exuberant celebrations are in the north, and most any of the big capitals in the north will have rollicking festivities. 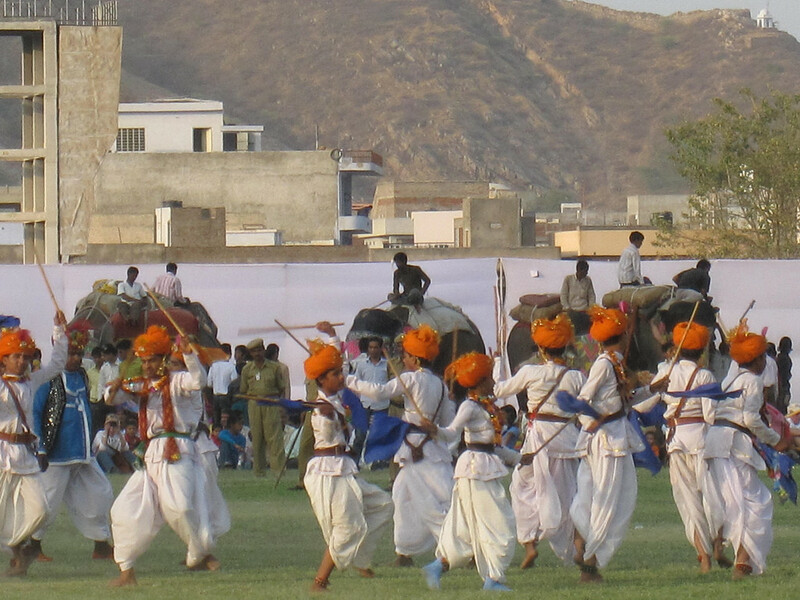 The Elephant Festival is only in Jaipur. Mathura and Vrindavan are the celebrations you most often see in the photos—these are huge, elaborate, and frenetic. Delhi is surely a good option; it has one of the largest and rowdy Holi celebrations. And if you want to be Holi adjacent, West Bengal has very beautiful cultural and spiritual (adn safe) versions of the Holi celebrations. Notable mentions include the lovely Udaipur, Barsana, and the alternative celebrations in Anandpur Saahib—or more ideas, this post compares 10 places to celebrate. In Jaipur, I stayed at the Krishna Palace Hotel, or you could stay at Lostouse. In Mathura, I recommend staying at Brijwasi Royal or Centrum Hotel. In Vrindavan, I recommend staying at Nidhivan Sarovar Portico. 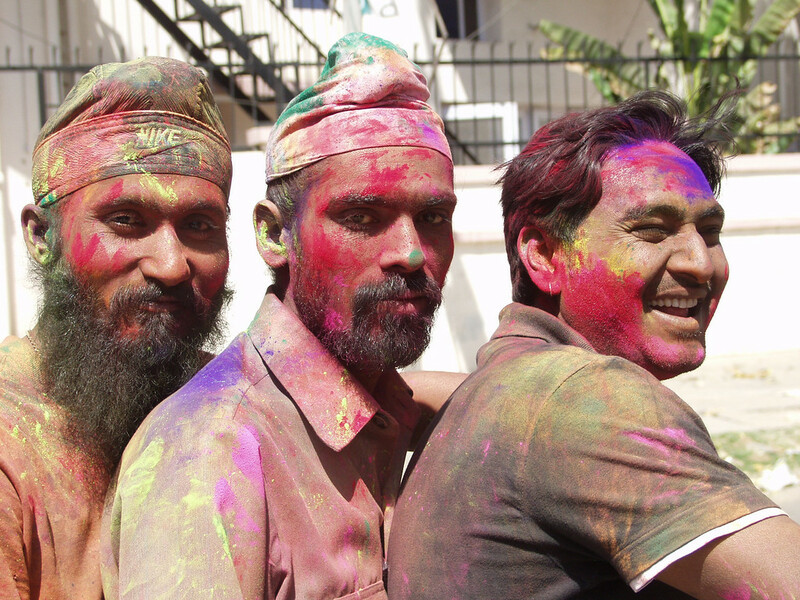 In Delhi, the Paharganj and Karol Bagh are both good for travelers and Holi revelers. I recommend staying at Hotel City Star or Wood Castle—and if you are staying for Holi, look up tickets and dates for the truly great Holi Cow music festival that takes place around Holi. At Basanta Utsav University in Shantiniketan in West Bengal, celebrations may start a day earlier than in other places. I recommend staying at Nayantara or Pubali Homestay. Always contact whichever hotel you book before you arrive and confirm if they are offering support for Holi activities and/or their recommendations for celebrating the nearby things to do for Holi. The exact dates for Holi change a bit every year, but this festival generally takes place in March. 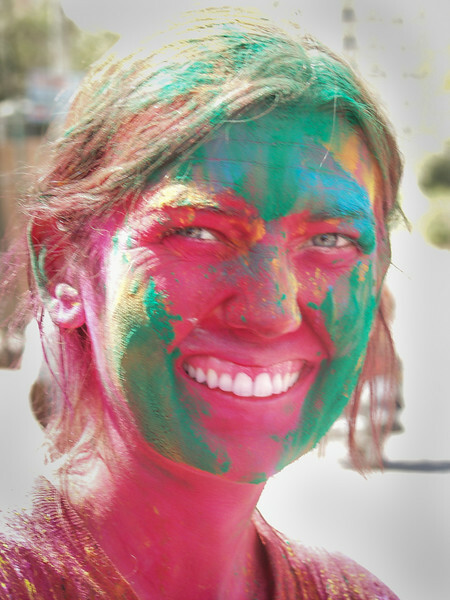 In 2009, Holi took place on March 11, and it generally varies two weeks in either direction. Research exact dates for the celebration, and pay careful attention to when the “Festival of Colors” will be held in your town specifically. Some towns celebrate for more than a week with religious festivals and other aspects of the holiday. Holika Dahan always occurs the day before the Festival of Colors. The celebrations are timed to occur the day after the full moon in March. The color festival is held in the morning, so plan to leave early as the throwing of colors finishes in most towns around 1pm. Traveling India is unlike any other place on earth. It also has a unique set of risks. 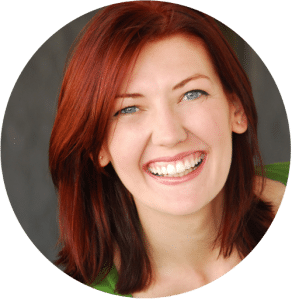 You should definitely have good travel insurance, World Nomads is my go-to recommendation, and consider reading this Traveler’s Health Guide to India. 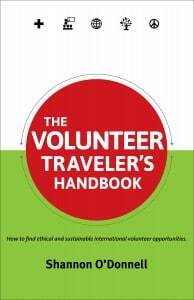 And if you’re a solo female travel new to traveling South Asia, consider this affordable handbook with the cultural norms and safety considerations. These tips will help you make the most of your celebration while staying safe and having a wonderful time experiencing Holi. Celebrate with a group of other expats, especially if you are a solo woman. The social taboos against touching are lowered for Holi, and there is alcohol involved—women will be groped when solo. Always best to do this with friends. Seriously, alcohol is consumed during Holi, usually bhang, and this really changes the environment. Be cautious, particularly women things can get scarily out of hand if you are not careful and in groups. Pick a guesthouse aimed firmly at tourists as they will help you partake in a safe Holi experience. Leave your guesthouse early in the morning, this festival is over by mid-day. Pick up some cheap white clothes as this is traditional Holi wear in many towns so you can then be tinted a million colors by the powder. You could also opt for really bright colors. But know that nothing you wear will survive past Holi. Wear a scarf over your hair if you don’t want it stained and colored for weeks. Some suggest oiling it beforehand as well. Do not allow Holi revelers to use the metallic colors on your skin, these are particularly harsh chemicals. Be cautious in the hours during and after Holi as groups of kids can get out of control and will throw things other than powder and water. Protect your camera, they will not hold back from water and powder just because you are holding expensive gear. Bring a raincoat for your camera, or shoot images from a high place, then put it away before joining the festivities. people until it just got unmanageable and had us all leave. the confines of the guesthouse). Hi there! 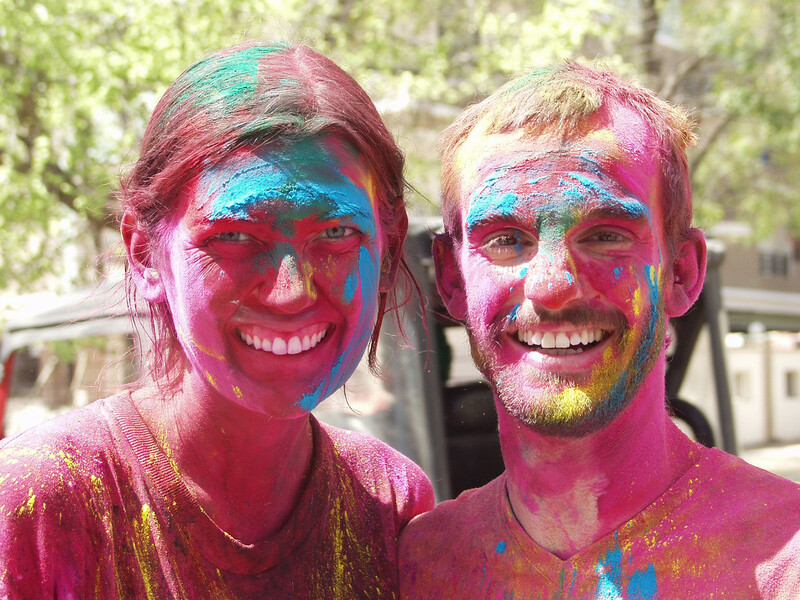 We are heading to India over Holi this year and were wondering if you recommend going to Holi here or trying elsewhere? The elephant festival sounds cool also? It was the day before Holi correct? Were there bonfires that night also? And one last question, what time did the elephant festival start?